Happy Labor Day weekend! There is nothing like a 3 day weekend to rest, recharge and catch up on the ever expanding to-do list. I'm excited that we are now in the month of September. Fall, my favorite season EVER, is right around the corner. I love fall for many reasons, but this year I am particularly looking forward to the temperatures cooling down and all this yucky humidity going away. In addition to cooler weather, I love that fall brings back everything in a pumpkin spice or apple flavor. As I type this, I am sipping on my first pumpkin spice chai of the season. DELICIOUS! It is like a slice of pumpkin pie in a cup. Since it is still 80 degrees outside, it may be premature to be drinking hot beverages, but the Caribou Coffee shop I am sitting in has their air conditioner up really high, so I think they wanted me to order a hot chai! No complaints here. As I wrap up August and my failed Whole30 attempt, I look at September as a new month and new opportunity to take on another challenge. 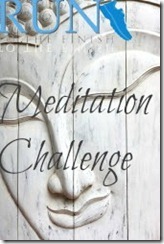 One of the blogs I read daily, RunToTheFinish, is hosting a 30 day meditation challenge. While I am all about taking on challenges that push me physically (ie. marathon training), the thought of a meditation challenge actually sounded a bit scary to me. Sure meditation is just taking the time to sit with your thoughts for a finite amount of time, but have you ever tried to meditate? IT IS HARD STUFF! For me, I sit down, get comfortable and close my eyes and within seconds, I have a million things running through my mind. "What am I going to have for dinner?" "Did I send that email?" "Is my phone ringing?" "My foot is falling asleep"..etc, etc, etc. My brain is constantly going, so meditation presents a big challenge for me. Additionally, meditating for a long period of time is intimating. Who has an hour to just sit there and do nothing? Obviously, there are more productive things you could do with that hour, so who wants to just sit and do nothing? This is a hard concept for my "getting-it-done" personality to accept. After reading this list, who wouldn't want to meditate? Well, easier said then done. Meditation takes practice and for me, it will take a lot of practice. And the ironic thing about meditation is when you need it the most, you will most likely be unable to meditate if you have not been practicing. When you are super stressed and you just need to sit a meditate, you will be too worked up to be able to calm down. That is why constant practice is so important. When you find yourself in a state of chaos, it will be easier to find your zen if you have practiced meditation before and now the feeling and place that you need to go to mentally. So yesterday was my first day and I am starting slow. 5 mins a day for now. I downloaded the Yoga Nidra Meditation app. The free version guides you through a 5 min meditation which is perfect for me now. Listening to a voice guide me through the 5 mins helps me with my concentration and keeps me from peaking at the clock every 5 mins. Do you practice regular meditation? If so, what are you tips? If no, try it out. Let me know how you were able to bring our mind back to focus when it started to wonder.